A picture paints a thousand words, just like a curtain does a room. The right curtain may add the dramatic look that you have always wanted for your living room (for instance) or it can be discreet and blending with the walls. The right curtain keeps light away, if you want to. Or it can keep the warmth inside, if you so choose. There’s the right curtain for every need (well, at least as much as curtains go), and you may certainly have various demands from the curtains around your house. You can get a clear idea about the different types of curtains. There are creative ways, though, to use curtains, some of them are surprising, some of them make sense, once you learn about them. Curtains may be hanged from the ceiling like a bed canopy. These curtains may be see-through, or have a vibrant color combination (black and white never goes out of style). This use of curtains creates a theater look for your bedroom, for sure. We all know women love their shoes. Well, why hide them? Forget about the closet and simply display a fun (or elegant, as it pleases you) shiny curtain, exposing your precious shoe collection with one pull. Maybe not all of us have an elegant, long lasting wooden entry door. In this case you can always use a curtain to create a dramatic pop of color in your entryway. Nicely done, right? When you moved to your knew home, having the eating area open into the kitchen seemed so much fun, whereas now… not that much. Well, curtains come to the rescue again! They can cordon off the dining room, so that you don’t see much of your kitchen anymore (not when you’re having a nice dinner with friends, anyway). Many of you out there might have bay windows. These windows communicate with the rest of the house and its walls and finding the right curtains for them gets tricky, indeed. If the house was built properly, a rod should be in place following the shape of the window. But this is quite difficult to do and is often overlooked, hence the curtain problem. A handy solution would be to have 3 different curtain rods. A single large curtain for all three windows is another solution for a bay window, as long as you don’t plan on opening and closing it. This solution is not not used, though, when the windows are large and go all the way up to the ceiling. In this case you’d need a curtain (operated individually) for each window, and the window gets covered entirely. A sticky problem appears if you only bought two curtains. Now this is where your creativity gets worked up really good- you can form a shallow balcony-like structure for the curtains to hide. Your bedroom gets a nicer look, actually, when it has bay windows. They give you the chance to include a reading corner or a small seating zone, maximizing the views. For those of you who like color in their life, the bay window is a great opportunity to color up your room. 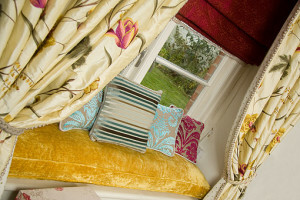 Simply use different colors (dramatic contrasts strike best) for the three/ four curtains from the separate windows. On the other hand, for a chic, neat look in your beach house, you can go for Roman shades with your curtains. The versatile look lets you have control over the light and gives privacy at the same time. Obviously, there are plenty of other ways to use the curtains around your house. You can go through our selection of curtains and decide which of them meets best your needs, your ideas and creativity style.